When I first heard that Google was creating an operating system that was basically just a browser, I thought it was silly and nobody would buy one. Looking back, I now think that it wasn’t a silly idea, it was a brilliant idea. 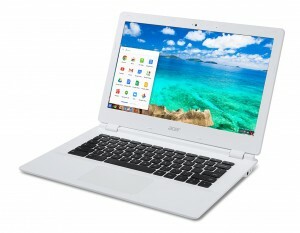 A Chromebook is a laptop computer that runs an operating system called Chrome OS. Unlike many of today’s laptops, a typical Chromebook has less memory (RAM) and very little hard drive space. It doesn’t need a lot of memory, because it isn’t running a huge operating system using a lot of power. It doesn’t need a lot of hard drive space because it is designed to use storage that is kept online. Since Chrome OS is so simple, it is very easy to use. It’s fast and secure. Its believed by many to be one of the most secure operating systems on the planet. If you ever have a problem, you can simply and quickly reset the whole computer by tapping the Powerwash button. It’s a great computer for modern cloud-based computing, especially if you use a lot of Google services. Even though I own a powerful (and expensive) Apple Mac Pro and a powerful (and expensive) Window’s 10 computer, I find myself often using my inexpensive Chromebook more and more. Many Chromebooks are in the $180-300 price range vs purchasing a PC or Mac for a lot more. I’ve put together a list of what computing tasks a Chromebook is good for and what it isn’t good for. Cloud based email – Using a Chromebook with Gmail works great. Browsing the web – Since a Chromebook is basically a browser, it excels at browsing the internet. Listening to music – Google Music allows you to upload any music of your own or sign up for their music service. It works well with other music services like Spotify or Pandora. Messaging & Video Conferencing – With Google Hangouts you can keep in touch with your friends, family and co-workers through messaging or using the built in camera for video conferencing. You can also use other services like Skype as well. Web-based games – A Chromebook works great running web-based games. If you play the game in your browser, it will work on a Chromebook. Documents and Spreadsheets – While I used to exclusively use Microsoft Office Products, I have transitioned to using Google Docs for 90% of my office work and I love it. Google’s office suite (Known as Docs) is fast, powerful and 100% web-based. Best of all it’s free. If you still want to use Microsoft Office, you can use their web-based Microsoft Office. Computer sharing – Schools love Chromebooks because they are easy to share. One student can log-on, use the computer to work on their assignments and then sign-off. The next student can simply log-in themselves without having access to any of the original students information. If you share a computer with other people, a Chromebook does this great! Photo organization and editing – There are many online photo tools that work great with a Chromebook. I have thousands and thousands of photos accessible through my Chromebook using Google Photos. There are many more programs out there that will help you edit and organize your photos. Remote desktop – When I’m away I use my Chromebook to access my PC and Mac at home. I can run any program on my computers at home from my Chromebook. I’ve edited and exported video clips from powerful video editing programs and uploaded them to the internet all from my Chromebook. Complex software – If you use a complex software program regularly such as Adobe Photoshop or Illustrator or if you use proprietary software that isn’t web-based, then a Chromebook isn’t going to work well for you. High-end Games – If you are a big time gamer, then a Chromebook is not for you. If you just play online games, then a Chromebook will work fine. Heavy Microsoft Office User – If you exclusively use Microsoft Office and can’t settle for the online version of Microsoft Office or Google Apps, then a Chromebook might not be the solution for you. No Internet Connection – A Chromebook uses the internet. If you don’t have a WiFi connection and/or access to the internet, then a Chromebook is pretty worthless. While most Chromebooks are inexpensive, the Chromebook Pixel is a powerhouse of a Chromebook. It boasts some impressive features.